Saturate the dirty area with pretreatment laundry stain remover. Wait one minute for the product to penetrate the stain. Launder immediately. To remove coffee (and chocolate stains), mix one teaspoon of white vinegar in one quart of cold water. Sponge on stain and wipe clean. Mix the yolk of an egg and a few drops of alcohol with a little warm water. Rub mixture on the stain with a sponge. Sprinkle a little baking soda on a wet dishcloth to quickly remove coffee and tea stains. 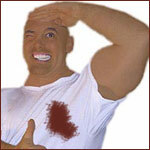 Of the four methods, commercial stain removers do the best job. The other three are effective if you don't have access to laundry supplies -- a restaurant, for instance. One final tip: if posssible never let a coffee stain set. The more dry the stain, the more rotten your chances are of removing it.